So it’s been awhile since I last stepped foot on a sheet of curling ice. About 15 years and 3 kids to be exact. I thought it would be like riding a bike. 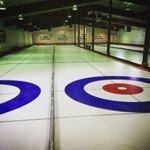 I knew what to do and I figured my body would also remember once I walked into the curling club. I had done the prep work – went to the local sports shop and bought a good pair of curling shoes and a broom. None of this throw a slider on a pair of runners – if I’m going to curl, I’m going to CURL. I stepped on to the ice and got down into the hack to practice sliding. My knees cracked – understandable it has been a while. I’m focusing on a nice slide – past the hog line at least – I used to be able to slide half way down the sheet. Focus, Breathe – and push out. OH.MY.GOODNESS. I could barely slide to the end of the rings let alone to the hog line. And then it gets worse – I’m there in sliding position and I can’t get up. There is no hopping up on two feet and staying in a squat as you watch your rock glide down the ice. No , there is a quick prayer sent straight to Heaven “Dear Lord, please don’t let me fall when I try to stand up” I slowly, very slowly, put both knees on the ice, brace myself with my hands and stand up – I’m like a 12 month old child learning to walk again. I just need to stretch more – right? Sweeping – let’s just say sweeping from one end of the ice to the other created more sweat than sitting in a sauna for 20 minutes – and it hurt my arms. But at least I didn’t fall or trip over a rock. Needless to say, at the end of the evening I was done. I was so frustrated! Coming back to curling IS NOT like coming back to biking. But you know what, it was still fun and I got to hang out with my friends. The next couple of days – well it was painful – but a good painful because my body was finally starting to remember what it used to do 15 years and 3 kids ago. Next week will be better – And maybe I will stretch more…..